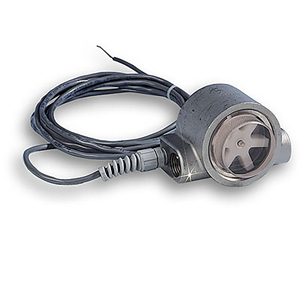 The FPR-200 series flowrate sensor integrates rugged tangential turbine technology with a precision digital-to-analog conversion circuit hermetically encapsulated within the body of the sensor. The flow sensor is ideal for measuring flowrates in cooling circuits, HVAC systems and batching operations. 참고: Comes complete with 3 m (10') cable and operator’s manual. For units with EPR seals, add suffix "-EPR" to model number; add $36 to cost. For Units with FKM seals, add suffix "-FKM" to model number; add $36 to cost.